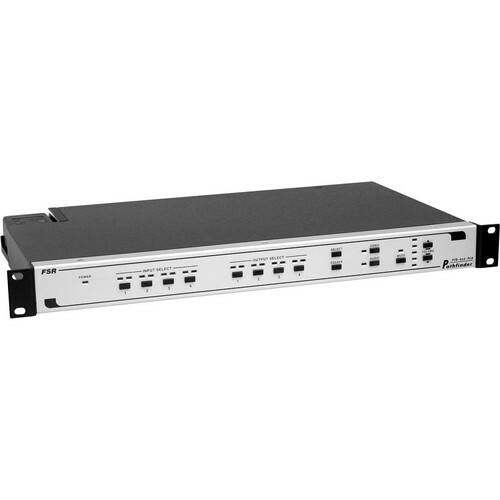 The PFD-4x2-PC Pathfinder Computer Video & Audio Matrix Switcher from FSR is designed to offer 4 inputs and 2 outputs of matrix switching capability for computer video signals. It is well suited for use in video & control rooms, educational institutions, government offices, and houses of worship, among many other possible settings and applications. The unit offers high bandwidth capacity to accommodate signals without degradation of clarity or color fidelity. The chassis has been optimized to maximize functionality while minimizing its footprint and the space it occupies in your rack or work area. The unit can be controlled via a set of ASCII commands using its RS-232 or via front-panel pushbuttons. This unit is designed to provide 4x2 matrix switching of computer video and stereo audio signals. It features high bandwidth to support signals transport without degradation. This unit has been designed to offer a smaller footprint to save space in your work area. It can be controlled via front-panel pushbuttons or RS-232 connectivity. This unit offers vertical interval switching. Box Dimensions (LxWxH) 22.0 x 15.0 x 5.6"